Note: The author provided me with a copy of the audiobook in return for a blog review. Fiona Skye delivers a story that has some elements familiar to recent urban fantasies: paranormal romance, vampires, shapechangers, faeries, and a sarcastic first-person point-of-view that guides the reader into a world just beyond our reach. What is interesting here is how the elements are put together and the original narrative voice provided through the protagonist. Riley O’Rourke is a journalist by trade, in charge of her own media company in Tuscon, Arizona. She’s of mixed Irish and Japanese descent, originally from Boston, and at this point in her life feeling confident in her own career and the little media empire that she has managed to create for herself. She’s also a “critter”–one of the shapeshifting were-beasts that populates the contemporary world, living a more or less normal life most of the time but letting her animal side out of the cage when the moon is right. Riley is a cat, a black jaguar to be precise, with whom she has a symbiotic relationship. The prologue explains how “critters” like Riley got out in the open a few years prior to the beginning of the novel. Her mentor and feudal lord, an ancient vampire named Onyx played a big role in this revelation and subsequent events. Balancing this is the appearance of a new federal agency called PLEB charged with policing “preternatural” citizens of all sorts. Having just adjusted to shapeshifters being a known quantity to the American public, a faerie drops by for a visit at Riley’s office. The faeries did not come out with the shapeshifters and vampires, and they have their own rather secretive agendas. To thicken the plot, a new PLEB agent is in town. David becomes, just a little predictably, Riley’s love interest. Everything evolves rather naturally. They carry on a mostly physical affair, though the author presents the emotional and steamy side of their relationship very effectively without getting caught up in too many, uh, choreographic details, shall we say? If you like paranormal romance, it is here aplenty without overtaking the mystery at the heart of the story. I’ll admit I had a major infatuation on David for a few days after finishing the novel. That mystery is how Riley fits into the faeries’ ongoing war, between Summer and Winter (or if you prefer Seelie and Unseelie) Courts. The novel is one part what it’s like being a shapechanger with enhanced senses and healing factor, one part what it’s like dating a hot guy when you can smell his every emotional flicker, and two parts quest–and this part kicks in towards the last half of the book. I really don’t want to say more because it would ruin a lot of the mysteries that unfold when Riley is ready to tell us about them–the author plots these details for the best emotional experience for the reader and in a natural way. 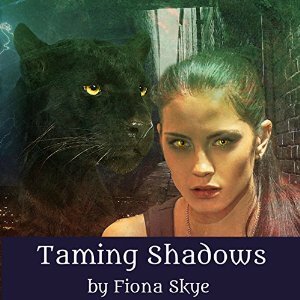 I rate Taming Shadows a solid 4.5/5.0 for an original urban fantasy that was balanced with paranormal romance elements and good, old-fashioned action scenes. P. J. Morgan’s narration (available on audible.com here) only added to the enjoyment. As a frequent audiobook listener, I do not often encounter good Boston accents, and the narrator nailed it.